Great read. 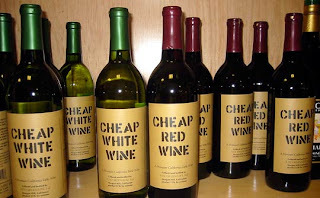 I have been doing a lot of work and discovering that there is an interesting facet to the very large sweet wine consumer segment that goes a long way to explain the observation: "The exceptions to the absence of brand loyalty tend to be drinkers of the cheapest wines. Beringer White Zinfandel fans feel about Sutter Home White Zin the way Ford buyers feel about Chevys. And Almaden and Carlo Rossi drinkers are also very loyal: they’ve find their drink, and they’re sticking with it." Consumer taste sensitivity, preference and behavior research I have have been conducting shows clearly the wine industry has slowly disenfranchised sweet wine drinkers around the world over the past 60 years. The wine community has created the position that sweet is bad (in spite of sweet wine being favored in France, Italy and even the UK for centuries) and that is is the 'wrong' choice with food. This has also created a 'sweet is cheap' attitude and low, artificial price ceiling for sweet wines in general. In fact, this segment of the population (sweet wine dirnkers)has the highest level of taste sensitivity and they frequently turn to other beverages, particularly cocktails, when they want to spend more money: having drinks with friends, dining out or celebrating. We are simply giving their business away. The spririts industry is delighted to have their dollars. The wine industry just rants on. Dr. Virginia Utermohlen at Cornell University, who I have been working with for several years now, has been conducting research that shows people with sensory hyper-sensitivity tend to glom onto products and brands and become the most brand loyal of all customers. This also explains some the the 'talk dry but drink sweet' brands that have emerged over the years: from Yellow Tail to KJ Chardonnay to Rombauer today. Their is a big opportunity here for the wine industry if we can get off our high horses. Turns out that we have a great number of things wrong about the histoical place of sweet wines and the consumers who drink them. But that is a longer story! It is like the line about advertising: "I know that 75% of what I spend on advertising is a waste of time and money. The problem, is, I can't tell which 75%."